Network Rail’s proposal for a major redevelopment of London Bridge station has been awarded formal planning consent. The decision means that from 2018 over 90m passengers a year - a 35m increase - will be able to travel through a brand new, state-of-the-art railway station. The plans are part of the second stage of the Thameslink programme to unlock much needed capacity on London’s rail network, and allow more services to travel to and through the capital. By changing the way the station works for passengers and the community, the redevelopment will remove a critical railway bottleneck as well as creating better pedestrian connectivity between Tooley Street and St Thomas Street. New street-level entrances on Tooley Street and St Thomas Street, as well as a permanent 24-hour pedestrian walkway through Stainer Street, will create better connectivity with strong links across the station linking north and south. This further supports the role that the station plays in bringing regeneration to Southwark. • London Borough of Southwark gave a recommendation to approve the scheme at its planning committee in December 2011. • Early work, including diverting utilities and other facilities, will be undertaken this year, ahead of major construction activity. The station will be built in approximately nine phases of work, beginning in summer 2013 and complete in 2018. The station will remain operational throughout. • London Bridge station redevelopment is a key part of the £6bn Thameslink programme to allow longer, more frequent train services to run to and through London. • The final station layout will have two dedicated platforms for Thameslink services enabling 18 trains per hour through London Bridge and six further trains through Elephant and Castle to form 24 trains per hour to travel through central London. Further work will also be undertaken further along the line to alter track layouts and relieve a bottleneck on this busy stretch of track. • The first phase of the Thameslink programme, which allows longer 12-car trains to use the Thameslink route, and sees major station redevelopments at Farringdon and Blackfriars, will be completed in summer 2012, in time for the Olympics. • More information is available at www.networkrail.co.uk/thameslink . A new coffee bar has opened at Loughborough Junction station offering a wide range of drinks and homemade food. The Beanery is owned and managed by Sabina Pieper and her business partner Koyser. Sabina makes all of her own food on the premises, including pizzas, cakes, and bread. She will also be offering homemade smoothies during the summer months. In addition, The Beanery will be operating as a wine bar from 19 April 2012 and will regularly host events such as live music and storytelling sessions. The Beanery is situated alongside the station’s entrance and is open Monday to Friday, 7am till 5pm. When the wine bar opens, the opening hours will be 7am till 5pm Monday-Wednesday and 7am till 11pm Thursday-Saturday. ScotRail’s SmartCard customers can now purchase their tickets online for the Glasgow to Edinburgh via Falkirk High line. Weekly, monthly and annual season tickets are available online and can be collected at automatic ticket gates, ticket vending machines, and platform validators. Tickets purchased before 18.00 can be collected at the station the following morning. Transport Minister, Keith Brown, said: "The additional facility for ScotRail's SmartCard customers on the Edinburgh-Glasgow via Falkirk High route to purchase their season tickets online via ScotRail's website is welcomed as it further enhances customer service and ease of use." Tickets purchased online at www.scotrail.co.uk/smartcard must be loaded onto a SmartCard within seven days. The season tickets cost exactly the same as paper versions. Customers can get more information and apply for a new SmartCard at www.scotrail.co.uk/smartcard-info or via the SmartCard Infoline by calling 0845 675 0892. Bombardier Transportation will deliver 16 Bombardier Twindexx Vario multiple units to Deutsche Bahn AG for operation on the Kiel-Hamburg and Flensburg-Hamburg lines. DB AG was awarded a contract to operate services on these regional lines in a Europe-wide tender process. The order is valued at approximately 160 million euro and is part of a framework agreement between Bombardier and DB AG from December 2008. DB AG has already ordered 135 of the variable double-deck coaches for intercity transport as well as 18 intermediate coaches and three double-deck power cars for regional services. Each of the 16 new four-car Twindexx Vario trains comprises two double-deck power cars and two intermediate coaches. The new trains will operate on the network LVS Schleswig-Holstein with speeds of up to 160 km/h. The trains are due to be delivered in the second half of 2014. With high-floor entry and LVS new interior design, the trains offer improved passenger comfort including more legroom and large storage spaces for luggage and bicycles. Wide doors allow passengers to enter and exit the trains quickly, especially during peak travel times. The centre buffer coupling enables double traction operation, allowing seamless travel without the need for passengers to change trains in Neumunster. The trains' single car concept means they can be lengthened or shortened easily to meet varying passenger demand. "Bombardier's innovative Twindexx Vario trains have proven themselves over many years of service," said Michael Clausecker, Chairman of the Management Board, Bombardier Transportation Germany. "With this order, we will be supplying Deutsche Bahn with the 2,000th of these modern double-deck coaches. Their variability in length, configuration and interior design is one of the key reasons for our trains' great success. We are delighted that they will continue to form the backbone of modern and efficient public transportation in northern Germany." The Twindexx Vario power cars are equipped with the reliable and energy efficient Bombardier MITRAC 1000 propulsion and control system. One of the advantages of this system is that it allows trains to accelerate quickly to an optimum speed. The double-deck coaches are built at Bombardier's Gorlitz plant in Germany. The bogies are manufactured at its site in Siegen, Germany, and the propulsion and control system is manufactured at its site in Vasteras, Sweden. Improvements for rail passengers under Government franchise plans came a step closer as the bidders to run services were announced by Rail Minister Theresa Villiers on 29 March 2012. A total of 13 firms are in the running to become the next operators of the Great Western, Thameslink and Essex Thameside rail franchises and introduce better train services, safer stations and more convenient ways to buy tickets. The firms bidding to take over the franchises have been chosen following a pre-qualification process. These potential providers will receive the Invitation to Tender which is anticipated will be issued in May 2012. It is anticipated that the successful bidder will be announced in December 2012, with the contract commencing in April 2013. The length of the franchise term will be 15 years. These potential providers will receive the Invitation to Tender which is anticipated will be issued in June 2012. It is anticipated the successful bidder will be announced in January 2013, with the contract commencing in May 2013. The length of the franchise term will be 15 years. These potential providers will receive the Invitation to Tender which is anticipated will be issued in October 2012. It is anticipated that the successful bidder will be announced in May 2013, with the contract commencing in September 2013. The length of the franchise will be a minimum of 7 years, with pricing also required for a potential extension of up to 2 years at the discretion of the Secretary of State. South West Trains has announced the completion of a multi-million investment programme to deliver regenerative braking across its fleet of Class 444 and 450 'Desiro' and 458 'Juniper' EMUs to save energy and provide even greener trains. The £2.2m programme has involved installing equipment on more than 200 electric trains which operate on the South West Trains network. These trains run services in the London suburban area, to Guildford, Alton, Portsmouth, Reading, Southampton and Weymouth. They are all now fitted with the new energy-saving technology. Energy produced by a train equipped with the regenerative braking system returns electricity to the third rail system, allowing trains in close proximity to draw on the electrical supply. The technology saves 50 million kWh of electricity annually, enough to power more than 11,500 UK homes for an entire year. Trains fitted with the technology include: the whole fleet of 30 Class 458 trains and the 172 Siemens Desiro trains (Classes 444 and 450). The modifications to the Desiro trains were carried out by Siemens technicians during the nightshift and at weekends to minimise disruption to the service. The regenerative braking project, which has been carried out in partnership with Network Rail and rolling stock providers Alstom and Siemens, is part of a major £11 million investment across Stagecoach Group as part of its sustainability strategy. Network Rail has confirmed the appointment of its chairman-designate, Professor Richard Parry-Jones CBE. The confirmation of his appointment follows a meeting with Network Rail's members. Professor Parry-Jones will start with the company on 28 March 2012 as a non-executive director, taking up his position as chairman if his appointment is ratified by members at the company’s AGM in July when Rick Haythornthwaite steps down. Professor Parry-Jones was born in 1951. He joined the Ford Motor Company as an apprentice and in 38 years with the company rose to be group vice president in charge of global product development and chief technical Officer. In his career with Ford he gained wide international experience in research and development, manufacturing operations and business leadership. Among the more than 70 vehicles developed under his leadership are familiar names such as the award-winning Ford Mondeo and the Ford Focus models. Currently he is a non-executive director of GKN plc and Cosworth Group Holdings as well as being council member of the Royal Academy of Engineering and of Bangor University. He is pro chancellor of Loughborough University and a visiting professor in the faculty of engineering. He also co-chairs, with Vince Cable, the UK Automotive Council. London Midland is introducing a vastly improved Sunday service to and from London on its Trent Valley route. From Sunday, 1 April 2012 the frequency of services to the capital will more than double with hourly services from Rugeley Trent Valley, Lichfield Trent Valley and Tamworth. Currently there are five London Midland services running to London from Trent Valley stations on Sundays and four making the return journey. From 1 April, this will more than double with 11 services travelling south and 10 making the returning from London. The services, which will run between Crewe and London Euston, are being introduced to meet customer demand on the busy West Coast route to London. Southern is pleased to announce that Brighton Line Commuters, the rail user group covering the Brighton Mainline and parts of the east and west coastways is launching a new and improved website. The new website www.brightonlinecommuters.org launches on Friday 30 March 2012. Brighton Line Commuters has some three decades of dedicated service to helping commuters who use both Southern and First Capital Connect services. Its Area Representatives are all regular commuters themselves and through Brighton Line Commuters provide a swift and effective response to comments and queries received. Planters in the style of a train made by Barrel Creations of Ardwell near Huntly are to become a feature at more ScotRail stations. Two such barrel trains have already been adopted by Huntly Development Trust at Huntly station and by the Rotary Club of Charing Cross at Glasgow's Exhibition Centre station. Now the Stonehaven Horizons group has adopted a barrel train which has been placed for it by ScotRail on the northbound platform at Stonehaven station. Stonehaven Horizons has painted and planted the barrel train, which joins the planters that it already looks after, supported by Deeside Timberframes. Allan Cairnduff, of Stonehaven Horizons, said: "We've painted the barrel train in the bright blue colour of the Caledonian Railway, which until 1923 served Stonehaven." Steve Ewen, ScotRail deputy station team manager at Aberdeen, said: "Barrel trains are set to become a distinctive feature on stations throughout the north-east, as we’ve offered them to adopters at other stations along the lines out of Aberdeen." Network Rail has announced framework agreements with four suppliers for the development and design of a new, European-standard signalling system for Britain’s railways. The successful suppliers are Signalling Solutions Ltd, Invensys Rail, Infrasig and Ansaldo STS. Starting in April, the collaborative agreements cover a one-year development phase which will confirm the suppliers’ design of a European Train Control System (ETCS) Level 2 signalling system. These will then be demonstrated on Network Rail’s new testing facility on the Hertford loop with contracts for the delivery of the programme to be awarded in 2014. ETCS is part of the European Rail Traffic Management System (ERTMS) – a tried and tested signalling system which will replace traditional line-side railway signals with a computer display inside every train cab, reducing the costs of maintaining the railway, improving performance and enhancing safety. The first drive to install ERTMS will take place on the Great Western main line starting in 2016 as part of the large-scale resignalling of the line, coinciding with the arrival of new trains and electrification between London Paddington and Heathrow Airport, Oxford, Newbury and Bristol. The East Coast main line (commencing 2018) and Midland main line (commencing 2020) are scheduled to follow soon after. Significant capacity improvements on some of the most popular routes on the Arriva Trains Wales (ATW) network will be introduced with the timetable change on the 14 May 2012. This has been made possible through increasingly smart use of the limited number of trains allocated to the Wales and Borders rail franchise. Arriva Trains Wales is responding to continued growth in passenger numbers by increasing the number of carriages and seats available on trains as well as providing some new/extended services. The following improvements are planned to begin on Mondays to Saturdays from 14 May, which are over and above the requirements set out in ATW’s franchise. *Extra seats between Shrewsbury, Telford and Birmingham in the morning commuter period. *Extra Seats between Birmingham and Aberystwyth in the mid-morning period. *Extra seats and extra services between Chester to Llandudno Junction in the mid-afternoon and evening commuter period. *More services between West Wales, Swansea and Cardiff. *Improved connections with ferry services from Ireland at Holyhead. In addition, through re-phasing of maintenance schedules, ATW is gearing up to provide further increased capacity for the major events occurring during the year, namely for the Olympics events in Cardiff and Royal Welsh Show at Builth Wales which overlap this summer. Seasonal increases in the number of services and seating capacity during the high summer holiday travel peak will also be a welcome addition to the timetable later in the year. These new improvements have been provided in addition to the contractual requirements in Arriva Train’s Wales’ Franchise Agreement and represent a substantial investment, made possible as a result of enhanced planning and increasingly efficient use of trains and personnel. Mike Bagshaw, Commercial Director at Arriva Trains Wales commented: “We are delighted to be able to deliver this great new investment in additional seats, extended services and improved train timings to our customers. Arriva Trains Wales remains committed to the enhancement of services above and beyond our franchise commitments. In excess of 340,000 extra seats a year will be provided in response to rising customer demand, reflecting a significant investment by Arriva in the future of rail services throughout Wales and the English Borders”. Consultation relating to these changes is in progress with Network Rail (who provide track access), stakeholders and passenger user groups. The new and strengthened services will commence as from 14th May 2012 as will other timetable changes that may arise through the consultation process. Customers are reminded that these improvements will result in some alterations to services used on a routine basis and so are advised to check the new timetable information published here; www.arrivatrainswales.co.uk/timetables. Customers can also see the relevant posters and publications available at stations on the network. Plans submitted by Crossrail and Aviva Investors for a commercial and retail development above the new Crossrail Liverpool Street Station western ticket hall shaft at 101 Moorgate have been given the go ahead by the Corporation of London. The new scheme will comprise approximately 88,000 sq-ft of new retail and commercial space in the City on Moorgate. The previous 1970s office building and former HQ’s of Amro Bank and Norton Rose, 101 Moorgate, has already been demolished for Crossrail to sink a shaft to provide access to Crossrail’s east and westbound tunnels. The new development will integrate carefully with the new and existing railway and will be constructed over part of the new Crossrail station and in part over the existing Metropolitan and Circle line tracks to Moorgate. 101 Moorgate is on the west side of Moorgate next to the proposed new western entrance to Crossrail’s Liverpool Street station. The development will wrap over and around the associated ventilation and emergency intervention shaft, the ‘Moorgate Shaft’, for the station. The proposed building in the City has been carefully designed to fit into the surrounding Moorgate area. The building’s height, facades and elevations all relate to existing buildings within this part of Moorgate. Crossrail also plan new attractive urban paving and public space around the new Moorgate station. The privately funded over-site development project will be built once work to construct Liverpool Street Crossrail station is complete in 2017. Income from over-site developments is a major element of the Crossrail funding package. Four ScotRail trains serving key cities have returned to service after a refurbishment under a £6m enhancement programme. They are the first of 33 trains to receive interior and exterior makeovers in a project due to be completed in December 2013. All the work is being carried out at Railcare Limited’s depot in Springburn, Glasgow – which employed 12 more people for the contract. The project, aimed at enhancing passenger comfort, takes place during routine maintenance cycles. It includes new carpets and toilet flooring and also involves rebranding the Class 170 trains in the new “ScotRail, Scotland’s Railway” unified livery. Two of the fleet, which previously had Standard Class seats only, have now been fitted with a new First Class behind the driving cab. All the trains run on Aberdeen, Edinburgh, Glasgow and Inverness routes. In addition, interior aspects such as grab poles, table stands and coat hooks are being re-coated in the new livery colours by Cumbernauld based Highland Galvanizers & Colour Coaters as part of a £300,000 contract which also includes work on the upgrade of ScotRail’s Class 334 trains. Transport Minister Keith Brown said: “I am delighted to see these newly-refurbished trains now appearing in service and offering passengers a more comfortable and attractive rail journey across the country. The Scottish Government is absolutely committed to encouraging as many people as possible onto public transport and facilities like these improved Class 170 diesel trains will go towards achieving that vision. This will help reduce our carbon emissions, cut congestion and therefore accidents on the roads and generally make the daily commute and other travel for passengers between Edinburgh, Glasgow, Dundee, Perth, Aberdeen and Inverness an even more enjoyable experience." Rob Baxter, Managing Director of Railcare, said: “This programme further emphasises the close working relationship we enjoy with ScotRail, helping them deliver high quality rail services that passengers deserve." Following the Official Commemoration of The Queen's Diamond Jubilee by the Mayor of London and the Chair of the London Assembly on Tuesday 27 March 2012, Transport for London (TfL) unveiled two new limited edition collectable Oyster cards which will hit the streets of London this summer, one celebrating the Diamond Jubilee and the other the London 2012 Games. The first card marks The Queen's Diamond Jubilee weekend in June. The card features an official portrait of The Queen and will be available from mid-May at all London Underground ticket offices and selected Oyster ticket machines within Zone 1, as well as TfL Travel Information Centres. The second card, expected to be available in mid June, celebrates all of the events taking place in the capital this summer, including the London 2012 Games. The images on the card nod to sporting activities, the Thames Diamond Jubilee Pageant, along with the Big Jubilee Lunch and the spirit of street parties and community that will make London a fantastic place to be this summer. This is the second time TfL has produced special limited edition Oyster cards. In April 2011, 750,000 Royal Wedding Oyster cards were released and the new cards are expected to be just as popular with regular commuters, collectors and tourists in London this summer. Millions of London Overground passengers will soon be able to access a free wi-fi service at every station on the network. A contract has been signed with wi-fi provider, The Cloud, to allow 60 minutes of free internet access at every London Overground station at no cost to the fare or taxpayer. Rollout of the service at London Overground stations, managed by joint venture company London Overground Rail Operations Ltd (LOROL) which operates as part of Arriva UK Trains, will begin in the summer and be completed by the end of the year. Passengers who use the ever increasing array of wi-fi- devices – including e-readers, tablets and smartphones and laptops – will be able to access a fast, free wireless internet connection. The service will be ideal for e-mail access, web surfing, social networking and media streaming. Transport for London (TfL) commissioned the contract as part of its commitment to delivering a connected approach to passengers. The installation of wi-fi on Overground services is a significant step forward and complements TfL’s recent commission which will see tube stations in zones 1 & 2 key Olympic interchange stations wi-fi enabled before the 2012 Games in late July. Passengers will have 60 minutes’ free internet access each day at each station through a one-time registration process available at all 56 London Overground-operated stations. Wi-fi access will be available in the immediate vicinity of stations. Major stations on the network that will be wi-fi-enabled before the end of 2012 include: North London: Willesden Junction and West Hampstead, South London: New Cross Gate, Forest Hill, West Croydon and Norwood Junction, East London: Surrey Quays, Dalston, Wapping and Hackney Central, West London: Kensington Olympia and Shepherd’s Bush. Network Rail has appointed BAM Nuttall to assist in the delivery of the Borders Railway as the project moves another step closer to delivery. The contract allows Network Rail to continue design and advance works on behalf of Transport Scotland prior to taking on a full project delivery role. The £2million contract enables BAM Nuttall to further develop designs of the railway route, including bridges, tunnels and stations. Network Rail will also proceed with ground stabilisation works in the Midlothian section of the route where remediation of former mine works is required. The contract includes an option to continue into the delivery phase once design is completed. While the preparatory works are under way, Network Rail continues to work with Transport Scotland with a view to taking on the delivery of the project. The Borders Railway will reconnect the heart of the Scottish Borders to the railway network for the first time in over 40 years. Travelling through Midlothian, the project will see seven new stations delivered along the 35 mile route -four in Midlothian and three in the Scottish Borders. * Promoting HS2 to the general public. Canary Wharf Group plc has completed construction of Canary Wharf Crossrail station’s platform level five months ahead of schedule, making it ready to receive the two giant eastern tunnel boring machines in 2013. Construction of the Crossrail project began at North Dock in Canary Wharf less than three years ago. Since then the construction team has driven over 1,000 piles and pumped nearly 100 million litres of dock water - the equivalent to 40 Olympic swimming pools. Approximately 300,000 tonnes of material has been excavated from beneath the dock bed and almost 375,000 tonnes of concrete poured. Canary Wharf Contractors Limited, the construction arm of Canary Wharf Group, has created a station box that is more than 250m long and 30m wide, approximately the same size as One Canada Square laid on its side, Britain’s tallest operational building. Twenty-eight metres below the surface of the dock, twin 7.6m diameter rings are now in place at both ends of the station ready to receive the eastern tunnel boring machines. Construction of the Canary Wharf Crossrail station box generated approximately 200,000 cubic metres of excavated material. About a quarter of this was reused on site and the rest was reused at regeneration areas including Pitsea and Hoo Island to create habitats for flora and fauna. The majority of the excavated material was removed by barges rather than lorries, saving more than 29,000 lorry trips and reducing carbon dioxide emissions by 780 tonnes. Crossrail’s eastern tunnelling contractor Dragados Sisk JV will shortly commence enabling works to receive the two tunnel boring machines that will be launched from Limmo Peninsula later this year. After the TBMs pass through, Canary Wharf Group will fit out the station with work due to complete in 2015. Work will continue to construct the levels sitting directly above the station box. Canary Wharf Crossrail station will be one of the largest stations on the Crossrail route. Crossrail will dramatically increase the capacity and resilience of transport services to and from Canary Wharf and the surrounding area, helping underpin further development and investment in this key business and shopping district. Journey times will be cut to many destinations across London. It will take just 6 minutes to travel to Liverpool Street, 8 minutes to Farringdon and 39 minutes to Heathrow. The Crossrail service at Canary Wharf will be 12 trains per hour in each direction during the peak. Crossrail services will commence in 2018. Canary Wharf Group has planning permission for four levels or 100,000 square feet of retail, topped by a spectacular roof top garden, community facility and restaurant semi-covered by a spectacular timber lattice roof. ScotRail is introducing its first-ever off peak season ticket. It will coincide with the construction works on the Forth Replacement Crossing project during April and May 2012. The offer is designed to encourage more people to travel by train between Edinburgh and stations in Fife - outside peak periods - when the works take place. It is also designed to help manage passenger loads at a time when motorists are being urged to take advantage of public transport when the major traffic management scheme is in force on the A92 and M90 in Fife. The seven day off peak season ticket will be more than a third cheaper than a regular season ticket. It will be available from 31 March until 6 May. From 9 April 2012 a contraflow scheme on the M90 between Halbeath and Admiralty for six weeks is likely to result in weekday delays of up to 30 minutes during peak periods. In addition, surfacing works will reduce the M90 south bound carriageway in the area to just one lane for four consecutive weekends from the middle of April. The weekend restrictions are expected to result in significant delays, possibly of two hours or more, and motorists are urged to avoid the area and use alternative routes or modes of travel. The new off peak season tickets are not valid on services that arrive into Edinburgh Haymarket between 07.35 and 09.30 or on services departing Edinburgh between 16.30 and 18.30. They can be purchased at ticket offices or on train where no ticket issuing facilities exist at stations. London Midland has announced their biggest ever on-line ticket sale just in time for the busy school holiday period. Highlights of the sale include prices as low as £3 one-way from Birmingham to London and £5.50 one-way from Liverpool to London. Prices for thousands of Off-Peak and Advance tickets have been reduced by up to 50% for travel between 9 April and 31 May. The sale is on one-way Advance purchase and Off-Peak return & single tickets bought on-line. Other eye-catching examples of the discounted fares include; Birmingham to Stratford £3.50 return, Birmingham to London £18.10 return, Crewe to London £22.20 return and Stafford to London £20.10 return. To publicise the sale, London Midland will be running a television advert – the first time the company has ever used television advertising. The adverts, which will be running in the ITV West Midlands region, were produced by Spirit Media in partnership with Birmingham based firm The Character Shop. Information on the sale will also be available on London Midland’s own YouTube channel www.youtube.com/londonmidlanduk from 5 April. Tickets are available from www.londonmidland.com/sale and, for even greater savings, Railcard discounts can also be applied. The London Midland network stretches from Liverpool to London and across the Midlands, with services running to destinations including Birmingham, Shrewsbury, Worcester, Hereford, Stratford-upon-Avon, Milton Keynes and Northampton. In recognition of the first Royal Train service as part of Her Majesty The Queen's Diamond Jubilee celebrations, Class 67 No. 67026 was unveiled arriving into Manchester Victoria Station 23 March 2012 in a specially commissioned Jubilee livery. The locomotive, which will haul the Royal Train to Jubilee events this year, is painted in silver with an image of the United Kingdom flag and was officially named Diamond Jubilee by HM The Queen. The celebratory design was commissioned by DB Schenker Rail UK, the Royal Train Operator, to commemorate the historic link between HM The Queen's reign and the railway. The Royal Train has been a central part of the travel arrangements of the Royal Family since the first service operated on 13 June 1842. The train will transport members of the Royal Family to Diamond Jubilee events across the UK this year. Alain Thauvette, Chief Executive of DB Schenker Rail UK, said: "During the Diamond Jubilee this special locomotive will convey members of the Royal Family using the Royal Train to engagements across Britain to celebrate this important year. The railway is proud to support the transport requirements of the Royal Household and we are delighted to have commissioned this special locomotive design to commemorate and celebrate HM The Queen's Diamond Jubilee." A summary of the incident is - At 19.27 hrs on Wednesday 6 April 2011, Network Rail track maintenance staff reported to Network Rail’s fault control the discovery of a collapsed structure beneath the railway between Bromsgrove and Stoke Works junction in Worcestershire. Although the structure was not visible from the track, the problem had been identified by a repeated loss of ballast from one of the tracks. Bridge 94 comprises a long underground watercourse running under seven tracks with only one point of entry/exit as a housing estate has been built over the other end of the structure. The RAIB investigation identified that: planned examinations of Bridge 94 since at least 1993 had not been completed (and did not reach the point where the failure ultimately occurred) because examiners were not equipped to enter the structure which was a confined space with poor ventilation. The individuals responsible for reviewing the examination reports did not identify that they were incomplete and no action was taken to conduct a complete review of the structure; and information available to Network Rail staff about Bridge 94 was poorly collated and inaccessible. The RAIB has already made recommendations relating to the effectiveness of Network Rail’s structures examination regime as a result of investigations into the failure of a river bridge near Feltham in November 2009 and more recently a lineside retaining wall in Halifax in February 2011. The report makes reference to recommendations from both investigations and includes statements on progress towards implementation. Network Rail has announced St Modwen has been selected as partner for a joint-venture to develop the 70-acre brownfield site, known as the Chaddesden Triangle, Derby. Owned by Network Rail and located next to Pride Park, the freehold site is the largest brownfield site in Derby. It has been identified by the City Council as a strategic development site and regeneration priority. It is predicted that developing the Chaddesden Triangle will create hundreds of jobs for the city. There was strong interest in the development opportunity, with the initial round of bidding producing 15 expressions of interest. A shortlist of seven was then compiled, of which St Mowden was selected as the preferred bidder. Detailed discussions will now commence on the structure of the joint venture and master plan proposals will be submitted towards the end of 2012. This site does not include the proposed new depot for Network Rail maintenance staff. These plans are being developed separately and further details will be announced in the coming weeks. Construction of Crossrail’s tunnels will get underway next month when the first tunnel boring machine is launched from Royal Oak. By late 2014, the construction of over 21km of twin-bore tunnel, stretching across the capital via central London and Docklands, will have been completed. As construction concludes, work will get underway to fit-out the tunnels with the necessary track and overhead power equipment to enable Crossrail trains to operate from 2018. This will include the installation of over 40km of track, overhead electric conductor rails to power the trains as well as ventilation and drainage systems. The new Crossrail tunnels will also require over 50 ventilation fans, 40km of walkways, 60 drainage pumps, 30km of fire mains as well as lighting throughout the entire length. This major contract will contribute towards the creation of further employment opportunities on Crossrail. Thousands of people will be employed in building Crossrail at the height of construction in 2013-15. Further jobs will be supported through the supply chain in London and in regionally-based manufacturers and suppliers. The fit-out works will be carried out within the entire tunnelled section of the Crossrail route between Royal Oak, Pudding Mill Lane and Plumstead Portals. It is envisaged that the selected contractor will start fit-out simultaneously from both Royal Oak and Plumstead portals. Northern Rail has extended its partnership with the Jane Tomlinson Appeal by supporting the charity’s latest Walk for All, this time in the Peak District on 29 April 2012. The partnership follows Northern’s provision of tickets to last year’s Dales Walk and naming a train Jane Tomlinson. For the inaugural Peaks Walk for All, Northern will once again donate 150 tickets to the Appeal who will sell them directly to walkers through their website and keep the revenue. There will be additional carriages on services throughout the day to transport walkers to and from Sheffield and Hope stations for the start and end of the walks. Northern has also worked with First TransPennine Express (TPE) to ensure walkers are able to reach Hope in time to set off on the 09.30 walk, with TPE’s 07.50 Sheffield to Manchester Airport service making a special stop at Hope station that morning. Like the successful Dales Walk last August, when 2,500 keen ramblers took to the Yorkshire countryside to raise money for various worthy causes, walkers will have a choice of three routes of 24 miles, 12 miles and 5 miles to suit everyone’s stamina and ability. Northern will be supporting the Dales Walk for All again in 2012, which takes place on Sunday 19 August with a choice of four routes. Network Rail later issued the following statement - Following today’s announcement of further funding for the Northern Hub, Network Rail chief executive David Higgins said: "Today’s announcement of further funding for the initial stages of the Northern Hub is a welcome show of confidence in rail bringing benefits to passengers as well as driving economic growth. To realise the project’s total value of £4bn to the Northern economy and create between 20,000 and 30,000 new jobs, the final stages of funding will need to be supported in the rail budgets to be announced later this year. When completed, this project will be a clear demonstration of how investment in smart infrastructure can unlock economic potential by connecting commerce and communities across cities such as Manchester, Liverpool, Sheffield, Leeds and Newcastle with 700 new train services each day." * Today’s announcement will increase capacity on the Sheffield-Manchester line and increase line speeds on this line and the Manchester-Bradford via Rochdale and Halifax and Manchester-Preston via Bolton lines. * The Northern Hub is Network Rail’s plan to stimulate economic growth by allowing for faster, more frequent rail services the cities of the North and will restore and improve Manchester Victoria station. It will provide 700 extra trains a day for 3.5million more people to travel by rail every year and allow for the doubling of capacity into the Trafford Park freight terminals. * The Northern Hub will bring £4bn worth of benefits to the region and could create 20,000 to 30,000 jobs. Including the costs of the new trains this is a return of £4 for every £1 invested. * The Ordsall Chord, a new link in Manchester city centre was given £85m of funding in the March 2011 budget. The development work of other aspects of the Northern Hub will continue as planned. From 07.00 on Monday 19 March 2012 until Thursday 31 May 2012 the platform 6 and 7 lift at Cardiff General station will be out of use due to a lift renewal program by Network Rail. Customers using platforms 6 & 7 need to know the following, Sword Security staff will provide customer support for any prams, buggies etc and will be located in the main subway. Any passengers with disabilities will be required to alight at Cardiff Queen Street station and a taxi will be provided to return to Cardiff Central station. Visitors to the South Bank caught a glimpse of history this last weekend, as work began to reinstall renovated railway cartouches at Blackfriars station. Two 16-tonne cartouches – giant iron plates bearing the insignia of the London, Dover & Chatham Railway that once served Blackfriars – were removed in 2011 to allow for the construction of a new southern entrance for Blackfriars station. The cartouches have been dismantled, restored and this weekend work began to reassemble them on site. Network Rail is rebuilding Blackfriars station to span the river Thames, making way for longer trains and more frequent services on the Thameslink route from Bedford to Brighton, through central London. A new entrance on the south bank of the river, the first to be built here for 120 years, makes cultural attractions such as Tate Modern, the National Theatre and Shakespeare’s Globe directly accessible from Blackfriars. The new south entrance to Blackfriars station was opened to the public on 5 December 2011 and quickly became popular with passengers, accounting for 40% of people entering or exiting the station. The reinstallation of the cartouches represents another milestone for the Blackfriars project, the coming months will see the installation of lifts providing step-free access to all platforms and the full reopening of the Thames Path under Blackfriars rail bridge which is currently closed at night. The south station entrance is just one part of a complete rebuild of Blackfriars station which is seeing platforms extended over the River Thames to make way for longer trains; a new Underground station and entrance hall on the north bank of the river; and 4,400 solar panels installed on the station roof, creating London’s largest solar array. First Hull Trains has appointed a new operations manager. Brian Christie, who hails originally from Scotland, he joined the Hull-based rail operating company in January. Brian has over 22 years worth of experience in the rail industry, in both the passenger and the freight field. Brian said: “This is the first time that I have worked for an open access rail operator. It is this rewarding challenge which makes me want to work at First Hull Trains. I believe this new role will give me the chance to put into practice the knowledge and skills I have accumulated over the past couple of decades in the industry. As operations manager, I am responsible for operational competency and safety amongst First Hull Trains’ staff. It is essential that the highest level of safety, quality and customer satisfaction is always upheld. We ensure this through regular staff training throughout the year and the continuous drive to meet the highest level of industry standards and be the best.I am enjoying my move to Hull, both professionally and personally. I have family in the area and am looking forward to spending some quality time with them. Hull is a fantastic place, with an excellent rail operating company, which we want the city to be proud of. As part of my role, I will endeavour to help take First Hull Trains to the next level of success. When time permits, outside of work I enjoy sporting activities. I play five-a-side football, golf and snooker,” he added. The Italian private railway operator Fuori Muro has awarded Siemens a contract for two Vectron DC locomotives. It is the first Vectron order from Italy. The vehicles will be built at the Siemens plant in Munich-Allach and delivered to the customer in December 2013. 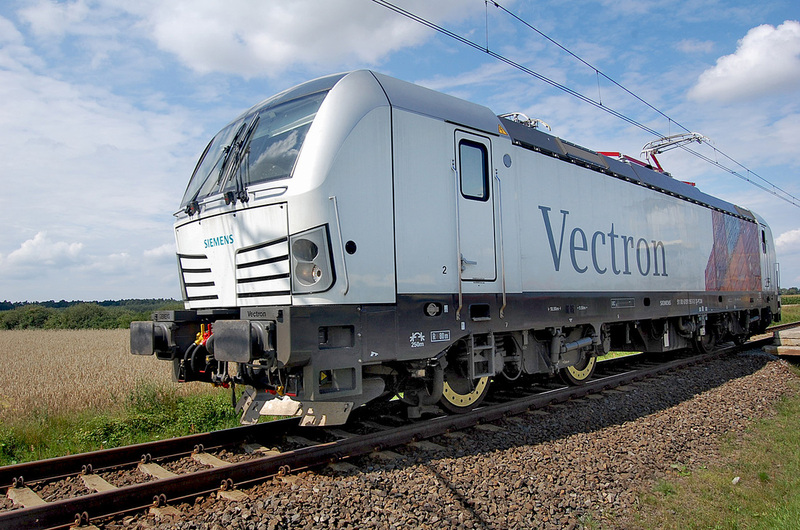 The Vectron is the new generation of Siemens locomotives for the European market and was presented for the first time at the 2010 InnoTrans International Trade Fair for Transport Technology. Fuori Muro will use the two locomotives primarily to transport freight on the roughly 60 kilometer long railway line connecting the port city of Genoa and the Interporto Rivalta Scrivia terminal in its hinterland. With a driving power of 5.2 megawatt and a weight of 80 tons the Vectron DC operates at a maximum speed of 160 kilometers per hour. The contract awarded by Fuori Muro is the first which Siemens has received for its Vectron DC locomotives worldwide. The first customer for Vectron locomotives was the Munich-based locomotive leasing company Railpool, which ordered six Vectron AC in December 2010. 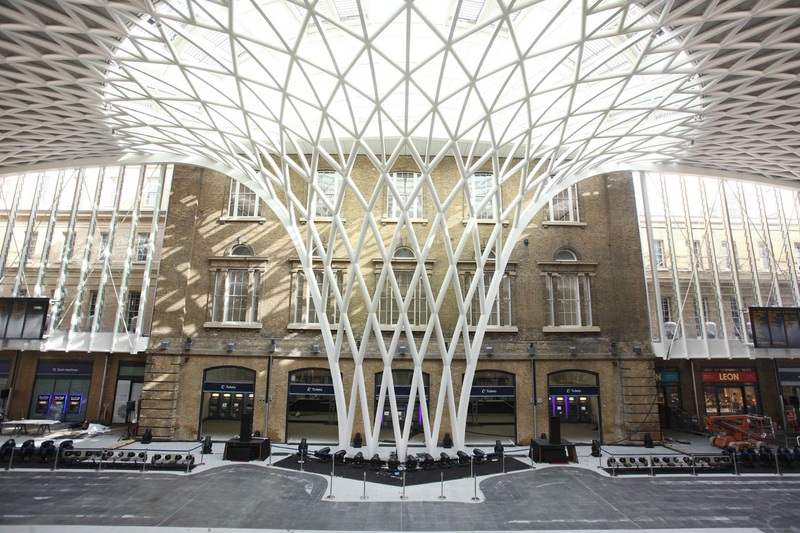 The biggest transformation in the 160-year history of King’s Cross station was finally revealed on 19 March 2012 with the opening to the public of the spectacular new western concourse. More than 45m passengers a year – travelling through London and to and from destinations including Cambridge, Peterborough, York, Newcastle and Edinburgh – now have improved facilities including better lighting, larger destination boards, clearer station announcements and more shops and restaurants. Tim Hedley-Jones, East Coast stations and property director, said: “East Coast is proud to be part of the redevelopment of King’s Cross station. We have been working closely with Network Rail and industry partners to transform the station. It is now a superb destination for the 13m customers who travel with East Coast to London. The enhancements to the station facilities located in the specially created western concourse include a brand new travel centre, a number of new retail and food outlets, as well as a customer information point. East Coast has also created a new First Class Lounge with easy access to both the new concourse and the platforms." 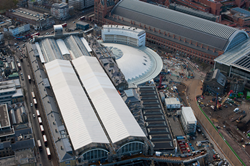 A stunning new glass and steel roof structure has been cleverly blended with the Grade-1 listed station’s heritage to create a space for passengers that is three-times larger than the current concourse, with improved links to both the London Underground network and St Pancras International station. The new concourse can be accessed direct from the Tube and for pedestrians from Euston Road, Pancras Road and via new arcades on the ground floor of the Great Northern Hotel. Network Rail and the train operating companies serving King’s Cross have been advising passengers about the changes to the station and will have teams on hand throughout the week to provide advice, foldout wayfinding maps and links to information online and via social media. Passengers departing from King’s Cross now access the platforms from the new western concourse, either at platform level or by using the new footbridge which extends across the full width of the main station shed and provides lifts and escalator access to all platforms. Passengers arriving at platforms 0 to 8 will leave the station through the existing 1970s concourse, which will be demolished after the London Paralympic Games. The area will be transformed into a new public open space, larger than Leicester Square, by September 2013. The £550m scheme marks the completion of yet another key transport upgrade for the Olympic and Paralympic Games. It takes the total investment in transport infrastructure in the King’s Cross area in the last ten years up to £2.5bn. Over a thousand tonnes of steel, one million specially made heritage bricks, five million ceramic tiles and five million metres of cabling were used in the construction. More than 5,000 people worked on the project, providing a vital boost to the economy with 15% of the work force coming from the local area. Northern Rail have named a a Class 156 after railway pioneer, Timothy Hackworth, who helped create the Darlington and Stockton Railway. The ‘Timothy Hackworth’ will operate around the north east, reminding passengers of his contribution to the railway and how influential he was in the production of the first ever locomotive for Stephenson engineering. The train was unveiled at Darlington station on Saturday 17 March 2012 by Northern’s Area Director, Richard Allan, alongside Jane Hackworth-Young, great, great grand-daughter of Hackworth himself. Children from the local Timothy Hackworth School in Shildon appeared in period costume, alongside local dignitaries from Darlington, Shildon and Durham. The GCR are offering 'your chance of a lifetime' to travel with the Olympic Flame on Tuesday 3 July 2012. The Great Central Railway is proud to announce it will be helping the Olympic torch on its way. As the flame makes its journey across the country, it will catch a lift on board a steam train between Leicester and Quorn. What’s more, there’s a chance for you to be part of its historic journey and travel alongside it! The special train will run on 3 July 3, as part of the Olympic Torch relay through Leicestershire. A runner will bring the torch to the GCR at Leicester North station (just off ‘The Sidings’ in Leicester) just after 8 o’clock in the morning on 3 July. Passengers are welcome to watch the torch bearer board the train, before joining the special steam service themselves. Olympian breakfasts will be served on board the train which will depart Leicester in the morning for the six mile steam journey to Quorn. Along the way it will pass through Rothley station and cross over Swithland Reservoir, through some of the Leicestershire’s best scenery, before arriving at Quorn and Woodhouse station. There will be a chance for everyone to get off the train and perhaps catch a snap for the photo album before the runner carries the torch up the station steps and away for the next stage of the flame’s relay. Fuel cost rises are not just affecting households and road users; the North Yorkshire Moors Railway has been hit by a doubling in coal costs over the last year, which has prompted a fundraising campaign for 2012 called ‘Cash for Coal’, launched on 19 March 2012 in Pickering. The railway, which is a registered charity, uses around 2500 tonnes of coal each year to fuel its steam engines, which run on the 24 mile stretch between Pickering and Whitby. The railway is able to claim back around 24p of tax per donated pound from donations made by UK taxpayers using the Gift Aid scheme, which will further help boost the coal bunker coffers. It is hoped that the campaign will raise £350,000 towards the railway’s fuel costs over the course of the year. “Our fundraising target equates to about £1 per person or a shovel full of coal travelling on the railway, but if coal and diesel prices continue to rise at these rates, we may have to move our final target, too!” adds Philip. Daily services resume on the North Yorkshire Moors Railway on 31 March for the school Easter holidays. Fares are £22.50 for adults, £19.50 for seniors and £13.50 for children for a day rover ticket allowing unlimited travel between Pickering and Whitby. A family ticket (two adults and up to four children) is available for just £45.00. Children under five ride free. The final run of preserved 'King' No. 6024 King Edward 1, before its major overhaul took place on 17 March 2012, when the loco powered the Pathfinder Tours 'Torbay Express' from Shrewsbury to Kingswear forward from Bristol. 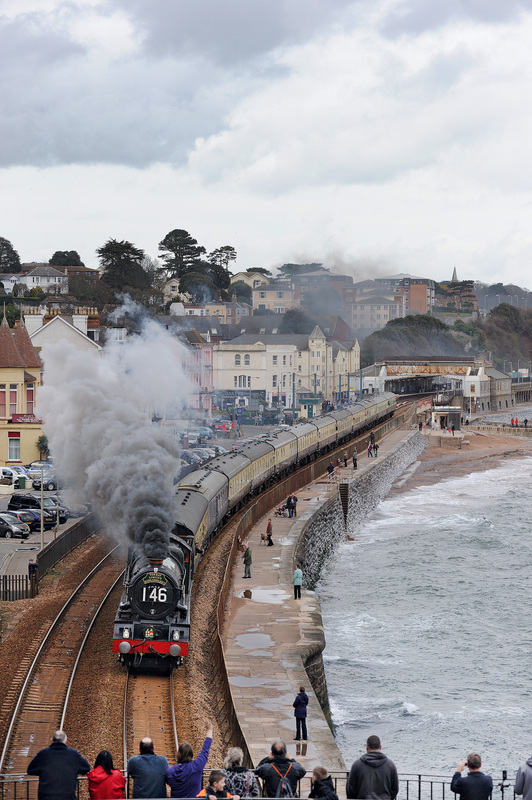 Running in rather dull conditions the train is seen passing Dawlish. Network Rail has cemented its presence in Hereford with a brand new maintenance depot, opening on 16 March 2012. The new facility of around £1m will be the strategic maintenance hub for the railway between Cwmbran and Ludlow and much of the railway in Heart of Wales. The depot, measuring around 4,000 square feet, is designed with modern facilities and extra room to house a bigger team, which has increased by around 25% since 2010. This move is integral to Network Rail’s wider devolution strategy in creating regional centres to become even more responsive to its customers and passengers. It also marks the company’s continuous commitment to improve the railway in the area (including Heart of Wales), where around £8m of improvement and maintenance work has been earmarked to be delivered by 2013. These works include improving the signalling through Hereford station to allow more trains to Worcester, Birmingham and London. Work has also started at Leominster and Hereford stations, where new lifts, footbridges, refurbished canopies and customer facilities are being installed to improve passengers’ travel experience. Passengers on the Lincolnshire coast will have a smoother ride after Network Rail completes track improvement this month. The work involves replacing 500 yards of rail, ballast and sleepers at Wainfleet on the Boston to Skegness line. The track between Boston and Skegness was opened in 1873 and has suffered from years of underinvestment. It is an important line for both residents and visitors and this work will give a new lease of life to the route. Work to renew the line has been scheduled around the busy summer season at Skegness. East Midlands Trains route manager for Lincolnshire and Norfolk, Nigel Carlisle, said: "The completion of this work is great news for passengers. We are already seeing the benefits of these improvements which provide the potential for improved journey times between Boston and Skegness as well as delivering smoother journeys for our customers." Replacement buses will run between Boston and Skegness on Saturday 24 and Sunday 25 March while the work is completed. A full road and footpath closure is needed on Station Road that weekend and over midweek nights to allow the works to be completed safely. Free transport will be provided to give people access to the town centre via the diversion route from 22.00 Saturday 23 March to 07.00 Monday 26 March. The investment at Wainfleet is worth approximately £400,000. Crossrail has announced its intention to award the contract for the last remaining tunnel portal at Victoria Dock to VINCI Construction UK Ltd. In line with European procurement rules the contract award is subject to a ten-day standstill period. Five new tunnel portals will be constructed as part of Crossrail at Royal Oak, Pudding Mill Lane, Victoria Dock, North Woolwich and Plumstead. The western and eastern running tunnels will have tunnel portals at Royal Oak, Pudding Mill Lane and Victoria Dock. The Thames Tunnel between North Woolwich and Plumstead will have tunnel portals constructed at either end. Construction of the first tunnel portal got underway at Royal Oak in January 2010 and was completed ahead of schedule in September 2011. The first Crossrail tunnel boring machine will set out on its journey from Royal Oak towards Farringdon later this month. The North Woolwich and Plumstead portals are included as part of main works for the C310 Thames Tunnel contract. Construction of the portal at Plumstead is well underway and mobilisation for the North Woolwich portal will begin in May following completion of utility diversion works. Enabling works for Pudding Mill Lane Portal were completed at the end of 2011. Construction for Pudding Mill Lane Portal, the new Docklands Light Railway (DLR) and Crossrail bridges and the viaduct for the new DLR station are now underway. Network Rail has been fined £1 million and ordered to pay costs of £60,015 following a prosecution brought by the Office of Rail Regulation (ORR) for breaches of health and safety law which led to the deaths of two teenage girls at Elsenham station footpath crossing in December 2005. The 15 March 2012 sentencing at Chelmsford Crown Court marks the end of the rail regulator’s criminal prosecution against Network Rail for the deaths of Olivia Bazlinton and Charlotte Thompson, aged 14 and 13 years old, who were struck by a train at the Essex footpath crossing on 3 December 2005. Network Rail pleaded guilty to two charges under The Management of Health and Safety at Work Regulations 1999 and to one charge under the Health and Safety at Work etc. Act 1974. These result from Network Rail's failure to carry out proper assessments of the risks to the safety of members of the public using the footpath crossing or to have in place adequate arrangements to underpin these assessments. 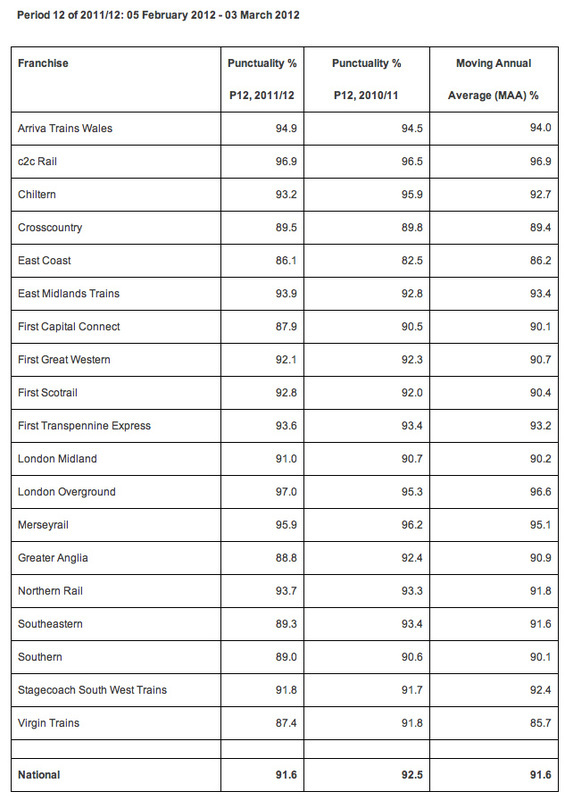 Punctuality on the railways reached 91.6% during period 12, according to monthly performance data released by Network Rail on 15 March 2012. The data for Britain's train services covers the period from 5 February 2012 - 3 March 2012. This compares to 92.5% for the same period last year. The moving annual average is now at 91.6%. On 15 March 2012 South West Trains’ Managing Director Tim Shoveller and Councillor David Leeks, Mayor of Basingstoke and Deane officially opened the new look Basingstoke station. The £1m project, delivered by South West Trains, now allows for a much improved access of the station and a better flow of passengers. The station entrance has been completely refurbished with a newer, brighter and larger booking hall. This is in addition to the recent installation of new toilets and baby changing facilities. The station hall has also been reconfigured and now features a striking new stainless steel and glass frontage, in order to improve the flow of passengers in and out of the station. Another improvement includes additional cycling facilities, equipped with shelters and CCTV, as part of South West Trains’ commitment to deliver greener travel. Basingstoke station has already benefitted from a new waiting room on platform 2 and 3. Banedanmark, the Danish railway infrastructure owner, has awarded Alstom a contract worth around €25 million to design and test Atlas, its ERTMS/ETCS on-board Level 2 solution. This solution meets the latest ERTMS standard and will be potentially deployed on 789 trains, mainly non Alstom-made ones, operated by 41 Operators on the Fjerbane Danish network. The design phase will last approximately 2 years. Development and deployment of the solution for the 789 trains would last about 6 additional years. During the design phase, Alstom and Banedanmark teams will jointly work in Copenhagen (Denmark) in cooperation with Alstom site of Charleroi (Belgium) which has already delivered similar equipment in Italy, Belgium and the Netherlands. A centre of competencies in maintenance and data management service located in Copenhagen would contribute to fully industrialize the deployment process of the new on-board signalling systems. The Fjerbane Danish network consists of approximately 2.000 km track line and 300 stations. Alstom’s on-board solution would enable Banedanmark and Operators to increase its operational performance, as well as it will improve punctuality for travellers in Denmark. This on-board ERTMS contract is part of a €2.4 billion programme decided by the Danish Parliament in January 2009 to renew all Danish railways signalling before 2021. 1 ERTMS (European Rail Traffic Management System) is a system for the management and control of the rail traffic on the lines of the Trans-European Networks. The ETCS (European Train Control System) is one of the components of the ERTMS. It was designed to enable trains to quickly cross borders, ensuring the safety of rail traffic. The countdown to the first train stopping at Fishguard and Goodwick station in 50 years has started. Improvement work to rebuild Fishguard and Goodwick station is nearly completed and passengers will soon be able to enjoy seven trains a day from 14 May 2012. The station will boast a brand new station building and a new car park that will also be equipped with disabled access. In addition, the platform has been resurfaced and 150metres of track has been moved towards the station to allow passengers to hop on and off trains safely. The success of this £450,000 scheme owes to a joint effort between Pembrokeshire County Council, Welsh Government, the South West Wales Integrated Transport Consortium (SWWITCH), Network Rail Wales and Arriva Trains Wales. Fishguard and Goodwick station is linked on the main bus route and easily accessible from both Goodwick and Fishguard town centres, therefore making it a potential gateway, especially for tourists visiting Pembrokeshire. 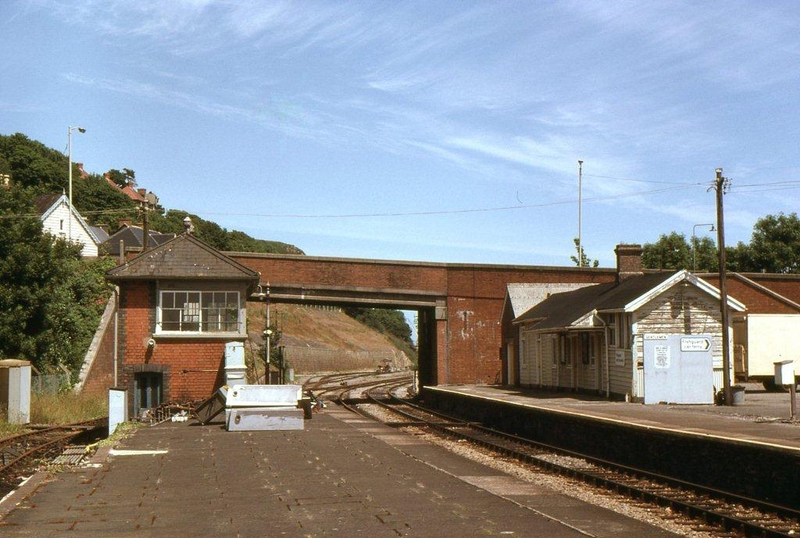 First opened in 1899, the station was named Goodwick station and was only renamed Fishguard and Goodwick in 1904. It was a terminus until an extension to Fishguard Harbour was built in 1906. The station land is owned by Pembrokeshire County Council and the station will be operated by Arriva Trains Wales, with Network Rail supporting the maintenance of the track and signals. Other major projects in west Wales include the refurbishment of Swansea station and the redoubling of Lougher – Gowerton, which is currently awaiting planning consents from local councils. Network Rail announced the completion of the new western concourse, the most spectacular part of the five-year programme to restore and improve King’s Cross station on 14 March 2012. More than 45m passengers a year - travelling through London and to and from destinations as far afield as Newcastle, Edinburgh and York - will benefit from a raft of improvements when it opens to the public on Monday 19t March. The £550m scheme delivers the biggest transformation in the 160-year history of the Grade-I listed station and marks the completion of yet another key transport upgrade for the Olympic and Paralympic Games. It takes the total investment in transport infrastructure in the King’s Cross area in the last ten years up to £2.5bn. Passenger benefits include a wide range of improved facilities including better lighting, larger destination boards, clearer station announcements and more shops and restaurants. 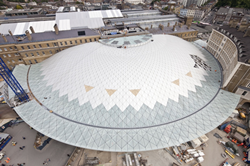 A spectacular new roof structure has been cleverly blended with the station’s heritage to create a space for passengers that is three-times larger than the current concourse, with improved links to both the London Underground network and St Pancras station. 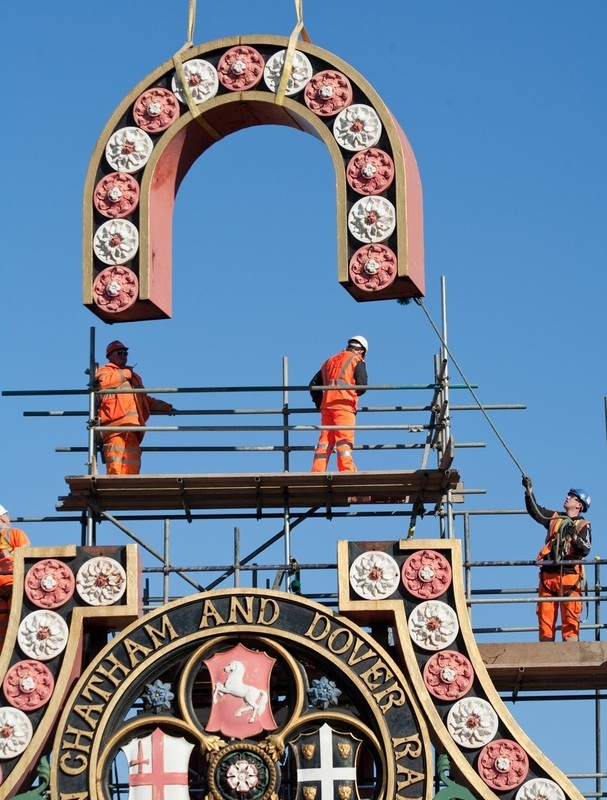 This spectacular project is a result of strong partnerships forged between Network Rail, train operators, the local council, architects, suppliers and English Heritage. It is also playing a key role as an economic catalyst, with a number of high profile businesses announcing plans to move to the newly redeveloped area around the station. To complement the wider improvements, King's Cross St. Pancras London Underground station was upgraded with a New Northern ticket hall funded by the Mayor, Transport for London and the Government. Opened in late 2009, it has provided a big increase in capacity, cutting congestion and improving accessibility. Longer trains are set to enter service with Virgin Trains next month (April), providing 150 extra Standard seats on some of the busiest services on the West Coast Main Line. The longer trains will initially work services on the London to Birmingham route, but as more 11-coach trains come into service they will also operate some of the busiest trains on the Manchester, Liverpool and Glasgow routes. By the end of April they are expected to be running on over 30 services every weekday with the benefits of the longer trains enjoyed by passengers across the Virgin Trains network. 106 new Pendolino vehicles are being built, which comprises four new eleven coach trains and 62 additional vehicles to convert 31 existing nine coach Pendolino trains to 11 coach. When all of the extra carriages are in service they will provide over 10 million extra seats on the West Coast Main Line every year. Passengers in North Wales saw more capacity provided on Virgin Trains services from Holyhead/Chester-London last year and this will continue to be provided on the route with the busiest trains continuing to be formed of ten coaches. South West Trains has gained its 10,000th Twitter follower only six months after launching its social media channel. The company, which operates one of the busiest rail networks in Europe, set up the account in September 2011 and it gained 500 followers within 30 minutes. Now @SW_Trains is one of the most followed of any train company Twitter accounts in London and the South East of England. The Twitter feed provides passengers with real-time service information. It is operated by senior staff at the Wessex Integrated Control Centre (WICC), which is jointly operated by South West Trains and infrastructure provider Network Rail. The WICC is the operations chalk face for the South West Trains network and @SW_Trains provides a direct line of communication to passengers from those working alongside route control managers and incident controllers. In a recent online passenger survey, 48% of customers said they found out about service delays through the South West Trains Twitter account. Some 86% reported that the information they received was very accurate, accurate or satisfactory. Ninety per cent also said the information was provided very quickly, quickly or within a reasonable time. As well as improved travel information, passengers are also seeing other benefits from the launch of the South West Trains Twitter account. Lost property is often reported by passengers on the Twitter feed and, in one case, a man’s mobile phone was recovered by another passenger and the item was quickly returned to its owner. The @SW_Trains Twitter account is the latest in a raft of measures introduced to enhance customer service. Additional steps include introducing a new mobile website, providing 850 frontline staff with smartphones, and issuing journey check email alerts tailored to individual passenger needs. The Land Transport Authority of Singapore has awarded Alstom a contract for the East-West metro line extension - known as the Tuas West extension - worth around €40 million. Tuas West extension works include the design, supply and installation of a 7.5 km double track on viaduct and aluminium 3rd rail, four elevated stations, plus the track in the Tuas depot which consists of 18.5 km of single track, mainly in ballast. The construction of the trackwork is scheduled for completion in 2016. Following its completion, Joo Koon station will be connected to Tuas Link station. The Tuas West extension is set to serve 100,000 passengers a day and reduce travelling time by up to 35 minutes. Alstom has been present in Singapore since 1964 and is a key player in the local market, having participated in the construction of key railway projects such as the North East Line (NEL) and the Circle Line (CCL), the world’s longest automatic underground metro. It is currently constructing the trackwork for Downtown Line phase 1 & 2, Singapore’s 5th MRT (Mass Rapid Transit) line, including the stabling tracks for the Gali Batu Depot which will provide its maintenance services. The company employs nearly 500 people with almost 40% in the Transport sector - the majority as engineers and technicians -, providing important local expertise in electrification, signalling, safety and railway telecommunications. “Our success in Singapore demonstrates our commitment to remain competitive whilst ensuring that we meet our customers’ needs for today and tomorrow”, declared Dominique Pouliquen, Alstom Transport Senior Vice President for Asia Pacific. Stagecoach Group announced on 14 March 2012 that they have launched an innovative ticketing scheme to allow passengers to travel by bus and rail on one smartcard. The smart ticketing pilot in Basingstoke, Hampshire, is one of the UK's first commercial multi-modal applications of the Government-preferred ITSO technology. Passengers simply hold their StagecoachSmart travel card over special readers on the bus, at ticket gates or on rail platforms. The announcement comes only a week after Transport Secretary Justine Greening launched the Government's rail strategy, which included a vision for smart ticketing inter-operable with other forms of public transport. The new pilot involves a small number of South West Trains season ticket holders travelling between Basingstoke and any smartcard enabled station outside the London area. A rail season ticket and a Stagecoach South Megarider multi-journey bus ticket giving unlimited bus travel in and around the town are stored on one smartcard. The integrated bus-rail pilot will be gradually expanded in the months ahead to include more passengers and further areas. More than 200,000 smartcard transactions are already made on Stagecoach’s bus and rail services each day. The Perth-based company continues to lead the way in working towards Transport Minister Norman Baker’s vision to have all public transport covered by smartcard technology by 2020. Stagecoach Group Finance Director, Martin Griffiths, said: "This exciting initiative means joined up journeys on rail and bus using smartcard ticketing is a reality on our transport network now. It is making travel easier and more convenient for our passengers, who can also benefit from our good value fares." In 2008, Stagecoach launched the UK's first national rail smartcard on its South West Trains franchise and ITSO smart ticketing is now live at around 100 stations on the network. Season ticket holders on the Group's East Midlands Trains franchise can now also switch from paper tickets to StagecoachSmart travel cards for travel between 26 stations on the network that are fitted with smartcard technology. Stagecoach’s smartcards are also in use in Cambridgeshire, Oxfordshire, Manchester and East Kent & East Sussex after the company become the first major UK bus operator to install the technology to accept them on its entire 7,000 fleet of buses outside London. In London, all 1,400 Stagecoach buses accept Transport for London’s Oyster Card. The StagecoachSmart scheme, using a system by Vix ERG, allows passengers to store their travel on an electronic card instead of using paper tickets. Bus customers can also pay for their travel through hassle-free automatic monthly payments. The majority of Stagecoach’s regional bus companies also now record concessionary travel journeys through the use of smartcard technology, including all of the Group’s vehicles in Scotland and Wales as well as all except two of its companies in England. East Coast has re-launched its successful '25 Reasons' campaign to offer its customers bargain low-cost First Class fares for just £25. Following its success last year, the campaign starts on Wednesday 14 March until Monday 19 March 2012, when customers can book one of 100,000 First Class one-way fares to any destination across the East Coast route. For example, customers travelling the 393.5 miles between Edinburgh and London can travel in comfort and style for just over 15 pence per mile. By visiting the dedicated web-page www.eastcoast.co.uk/25reasons, East Coast customers can take advantage of the fantastic deal and book tickets for travel between 10 April and 31 May inclusive, excluding 4-7 May. The 25 Reasons marketing campaign, has been shortlisted in the Travel Marketing Awards, which takes place on 22 March 2012, for the Best Email Campaign. The campaign highlights the many great reasons to travel First Class, such as the complimentary food and drink service, free Wi-Fi, a dedicated quiet coach and a more spacious and relaxing environment. The £25 one-way fare is available from www.eastcoast.co.uk/25reasons, where customers can also find out information on train times, fares and other promotions. In addition, customers can now follow East Coast on the official Twitter account @eastcoastuk. The Rail Accident Investigation Branch (RAIB) has released its report into a boiler incident on the Kirklees Light Railway, 3 July 2011. On Sunday 3 July 2011, a steam locomotive hauling a passenger train on the Kirklees Light Railway (KLR) ran low on water in the boiler. The train crew did not take prompt action to deal with the situation and the boiler overheated, damaging the locomotive and giving rise to a risk of injury to the train crew if the overheated metal had ruptured. The driver did not ensure that sufficient water was put into the boiler during the journey and did not remove the fire from the locomotive when he realised the water had run low. The driver had just completed his training for driving steam locomotives on the KLR. The underlying cause was that the KLR safety management system was inadequate to deal with the risks arising from operation of a steam railway. Two recommendations have been made to the KLR concerning their safety management system and in particular relating to staff competency, training and procedures. The RAIB has noted deficiencies in safety management systems and their implementation as a recurring theme in several recent investigations of incidents on heritage railways. The report acknowledges that the ORR is aware of this problem and has planned actions in this respect. Therefore, the RAIB has not made a recommendation on the regulation of safety in the heritage sector, but has agreed to meet with the ORR towards the end of the year to review whether there is evidence that the sector has responded to the ORR initiatives. To celebrate the opening of the Marshlink Line following a nine-week closure for tunnel, bridge and track repairs, the Sussex Community Rail Partnership organisation is hosting a series of country walks. For details of which walks are taking place and when, visit the Southern website at this link. Passengers at Huntingdon station are now able to use a new footbridge as part of a scheme to make the station more accessible for all. Under the £3m project, which is funded by the government's Access for All scheme, two new passenger lifts will also be installed at the station, making it easier for passengers to move around the station. These improvements will provide passengers step-free access between the station entrance and platforms for the first time. The old footbridge deck was removed on the weekend of 11 March 2012. The new lifts will come into use in July. Ian Duncan-Santiago, First Capital Connect's project director, said: "This £3m investment at Huntingdon Station is fantastic news for First Capital Connect's customers. We will be working closely with Network Rail to ensure passengers face as little disruption as possible while the remains of the old footbridge are dismantled." The Mayor of London and the Secretary of State for Transport revealed the giant 1,000 tonne tunnel boring machines that will carve Crossrail’s tunnels under the capital in a ceremony at Royal Oak on 13 March 2012. On 13 March 2012, the first of eight enormous machines, each 150 metres long and weighing 1,000 tonnes, began their journey to the Royal Oak Portal in west London from where, next week, they will start tunnelling 6.4 km (four miles) east to Farringdon via Bond Street and Tottenham Court Road. The machines are equivalent to 14 London buses end to end with enough force to lift over 2,900 London taxis. John Baron MP for Basildon and Billericay officially opened the improved and upgraded Billericay station on Friday 9 March 2012. The project will also be supplemented by a further investment in secure cycle parking from Essex County Council, which will be installed in the coming weeks. The improvement scheme has also been designed to provide for the installation of automatic ticket gates and passenger lifts at a future date. 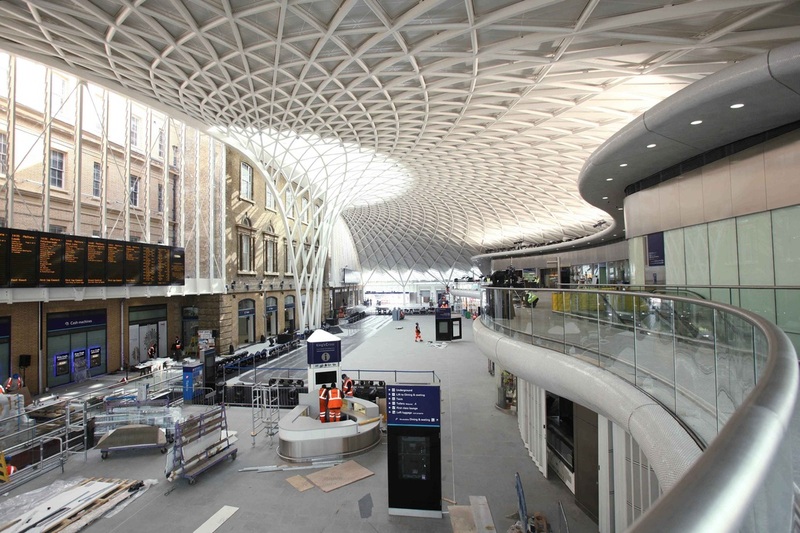 Next Monday 19 March 2012 will see the biggest transformation in the 160-year history of King’s Cross station with the opening to the public of the spectacular new western concourse. The shell-shaped glass and steel building provides three times the space of the current station concourse with better facilities, new links with the Tube, better links to St Pancras station, more shops and restaurants, larger destination boards and clearer station announcements. From next Monday, passengers leaving on trains from King’s Cross will need to enter the station from the stunning new building on the western side of the Grade 1 listed station. There are entrances to the concourse direct from the Tube and for pedestrians from Euston Road, Pancras Road and via new arcades on the ground floor of the Great Northern Hotel. Passengers will need to understand how the layout of the new station works, as the existing 1970s building on Euston Road that currently serves both arriving and departing passengers will cater only for arrivals until its demolition begins after the London Paralympic Games. The area will be transformed into a new public open space by September 2013. This week Network Rail and the train operating companies serving King’s Cross are distributing wayfinding maps to station users to help travellers understand the imminent changes to the station, with further advice online and via social media – all aimed at a smooth transition to the new station layout. The London Skolars are the latest sports team to turn to Virgin Trains to take them to key away matches. The club, who play in the third tier of professional Rugby League, are the only southern based club in their division and this means travelling in excess of 4,000 miles this season to fulfil away fixtures. Long coach journeys to and from opposition stadiums often mean that the squad do not arrive back in London until the early hours of Monday morning. Travelling on Virgin’s 125mph tilting trains will significantly reduce journey times and also enable the team to arrive refreshed for the match and provides much needed recovery time on the return journey. Virgin Trains provides a tailor-made service, for large groups, who want to book an entire carriage through to an entire train. It is this flexible and personal approach that has attracted many of the leading football clubs to switch to Virgin Trains for their important journeys. Eurostar has over 150,000 seats available at the attractive £69 return lead-in fare for travel up to 7 July 2012, so travellers can enjoy a spring or summer break for less. With festivals, street markets and blockbuster exhibitions, there is no better time to visit Paris, Brussels or Lille than in spring and early summer and with 'Eurostar Plus' a city break can cost less than you think. The Eurostar Plus collection of offers includes Plus Gourmet, Plus Shopping and Plus Culture. For example, through Plus Culture passengers can receive 2-for-1 entry into paying exhibitions at top museums and galleries in Paris, Brussels and Lille, simply by presenting their Eurostar ticket. So whether you're visiting the highly acclaimed Degas exhibition at the Musée d'Orsay in Paris or the Musical Instrument Museum in Brussels, there's plenty to keep you entertained with Eurostar's Plus Culture offers. Nick Mercer, Commercial Director for Eurostar, said: "Attractive pricing gives people the perfect excuse to treat themselves to a getaway. Many of our passengers tell us spring is their favourite time of year to visit Paris, Brussels and Lille and with so many things going on in the cities at this time, it's easy to see why." Tickets for travel from London St Pancras International, Ebbsfleet International and Ashford International to Paris, Disneyland Paris, Brussels and Lille start from £69 return in Standard and £189 return in Standard Premier, travellers are encouraged to book early to avoid disappointment. For more information, to check availability and to book Eurostar tickets visit www.eurostar.com or call 08432 186 186. Chiltern Railways are helping London Marathon runners reach the finish line by giving them free travel on any of their services on Sunday, 22 April 2012. Runners simply need to present their official Marathon tabard or race number to ticket inspectors. Chiltern have also added an additional train to accommodate entrants travelling early into London. This train will start at Aylesbury at 06.56 and will call at Princes Risborough at 07.09, High Wycombe at 07.20, Beaconsfield at 07.26, Gerrards Cross at 07.32. It will arrive at Marylebone at 07.56. The operator will also run one additional train from Princes Risborough to Marylebone for spectators: Princes Risborough 09.05, High Wycombe 09.16, Beaconsfield: 09.22, Gerrards Cross: 09.28 and London Marylebone: 09.53. Spectators can also make use of a great selection of fares to get you to London for the day including our super off peak ticket and our Groupsave ticket, which allows one or two people to enjoy free off-peak train travel when two other adults buy Cheap Day Return or Off-Peak Day Travelcards. The Group communications team will also continue to distribute news via email and publish a range of information, factfiles, features and video resources on our corporate website: www.stagecoach.com. Customer information about many of the Group's individual bus and train services, including travel updates, is available through a range of separate Twitter accounts. Steven Stewart, Stagecoach Group Director of Communications, said: "Stagecoach bus and rail services are used by around three million customers a day. Passengers are increasingly using Twitter to get fast service updates and answers to questions about their travel. Our rail company, East Midlands Trains, recently hosted its first 'Tweet the Senior Team', session which was a great way to engage with our customers and get useful direct feedback to help us improve our services. The new @stagecoachgroup Twitter account will help keep a range of stakeholders updated on the initiatives, developments and achievements across our business in the UK and North America. We are monitoring the effectiveness of our current Twitter channels as the number of followers continues to grow and we will look to extend our use of social media further in the future." South West Trains: @SW_Trains provides regular service updates on train services running in and out of London Waterloo on what is one of Europe's busiest rail networks. East Midlands Trains: @EMTrains is the official resource for up-to-the-minute service updates for Britain's most punctual long-distance train operator. Virgin Trains: @VirginTrains provides news and advice about the company with the best customer satisfaction rating of any long-distance train operator in the UK. Stagecoach East Scotland: @StagecoachEScot gives customers travel information and service updates for bus routes in East Scotland. Stagecoach Oxford: @Stagecoach_Ox provides service information for our local network where we run one of the greenest bus fleets in the UK. Oxford Tube: @Oxford_Tube offers news and travel updates for Europe's most frequent express coach service, which runs between Oxford and London up to every 10 minutes 24 hours a day, 365 days a year. Scottish Citylink: @ScotCitylink has up-to-date information and exclusive offers for the number one provider of express coach travel in Scotland. megabus.com: @megabus is where you can get information from the budget coach operator's North American Twitter team. megabus.com offers intercity, express bus service to more than 70 cities in the United States and Canada from just $1, plus 50c booking fee. Twin America: @GrayLineNewYork is the official source of information about New York City's classic red, double-decker bus tours, while @CitySightsNY also provides updates, alerts and offers about its sightseeing tours in the Big Apple. The thousands of passengers who use Balham station every day can now enjoy better journeys now work on a £1m, eleven month programme to upgrade facilities has been completed. Local MPs, Sadiq Khan and Jane Ellison joined project managers, LB Wandsworth Council representatives, Southern directors and staff, Network Rail, suppliers and stakeholders to celebrate the improvements at the rejuvenated station. The improvements, which were funded through the National Stations Improvement Programme include improved step free access to the station at the main entrance on Station Road, relocation of the main gate line, a new gated entrance from Balham High Road also offering step free access, improved ticket availability, two new Ticket Office windows that offer access to all, improved Customer Information Screens, a deep clean to the station, improvements to the platform canopy and improved signage. Wandsworth's cabinet member for transport Cllr Russell King said: "These station improvements will be warmly welcomed by the many thousands of people who use the station every day. This investment in the area's transport infrastructure is great news for commuters and also local businesses because it builds on Balham's growing popularity as a key shopping and leisure destination." The ticket office now has two new adjustable height windows which formed part of the Southern programme for access improvements, and the DfT Railways for All Team Small Schemes fund, which is part of the DfT’s Access for All programme which helped fund the windows. With permission, Mr Speaker, I would like to make a statement on railways. Our rail network matters… to our quality of our life… our national wellbeing… and our country’s future prosperity. For this Government it’s a simple equation… good transport equals good economics. But, too often, we find ourselves frustrated and disappointed when the cost, punctuality or comfort of rail travel don’t come up to scratch. I believe that Government and the rail industry can and must do more for passengers and for taxpayers. Of course, investment has a huge part to play. That is why we’ve been investing in our transport infrastructure… because that’s one of the best ways to support business, generate growth and create jobs. And, for rail, that has meant the biggest modernisation programme since the Victorian age with £18 billion invested in this spending period. But Mr Speaker, it’s not enough only to invest in them… it’s also vital to make sure they are set up for success. So today, I am setting out our plans to do precisely that, with the publication of our Rail Command Paper, entitled ‘Reforming our Railways: Putting the Customer First’. Mr Speaker, I have taken the ‘Ronseal’ approach to the name. This strategy will do what it says on the tin: put the customer first. The hallmarks of our railway must be high standards and low costs… a railway that offers the best services and the best value. That means a rail network which is efficient, effective and affordable. Nevertheless, in his Rail Value for Money Study, Sir Roy McNulty concluded that our railways are among the most expensive in Europe… and that’s in spite of the strong and steady growth in the number of passengers using them. Sir Roy identified inefficiencies worth £2.5 to £3.5 billion-a-year… and the people picking up the tab for this costly efficiency gap are passengers and taxpayers. So reform is long overdue. Passengers rightly want to know that we have a plan to end the era of inflation-busting fares seen over recent years.And taxpayers rightly want to see railway subsidy reduced to help us tackle the fiscal deficit. My message to everyone today is very clear. The days of spiralling and unjustified rail costs are coming to an end. Under this Government, the rail industry will only be able to compete for future investment if its long-term cost issues are addressed, and if it can earn the right to grow. I’m pleased to say that Network Rail is already due to deliver £1.2 billion of efficiency savings by 2014 with at least a further £600 million expected by 2019. But, as Sir Roy so clearly set out, we need to go further. The railway as a whole needs to become less dependent on Government subsidies. That’s why we want the industry to fully close the efficiency gap of £3.5 billion per year identified by Sir Roy, by 2019. Managing and reducing costs. Balancing budgets. Targeting investment where it can drive long-term growth and jobs, delivering more capacity and better service for the investment that goes in. The time is right for reform. I believe we are in a good position to build on recent efficiency gains to further improve the performance of the industry – and to improve the passenger experience. The programme of work that will decide rail outcomes and funding for the five-year period from 2014 is now well under way, and this sits alongside a period when we will see the biggest round of re-franchising since the privatisation of the industry. Both represent a further opportunity to really change our railways for the long-term better. Today’s Command Paper sets out our ambitions for Britain’s railways and the agenda for change that both Government and industry will follow in the months and years ahead. By reforming the industry, we will achieve substantial savings. Those savings will allow us to cut and then abolish above-inflation rises in average regulated fares… and it will ease the burden of the railway on the broader public purse. Taken together with my decision to limit the most recent increase in regulated fares I believe this will have a positive long-term impact on household budgets. For reform to really be effective there needs to be closer collaboration between the infrastructure managers, in other words Network Rail, and those who provide passenger services, generally the Train Operating Companies. Only through better joint working will we reduce costs and improve the customer experience. The industry is already pushing for better alignment between track and train. We look to them to bring forward partnerships equipped and incentivised to deliver not just better services, but also better value. The rail industry, led by the Rail Delivery Group, has also declared itself willing and able to respond to the strategic and operational challenges that the railway faces. Such leadership across the industry will be essential if we are to get the most out of our reforms. Rail franchises will be reformed with greater transparency around costs and efficiency… again to ensure best value for fare-payers and taxpayers. Franchises will be longer, giving train operators the flexibility they have been asking for, more time to make the biggest investments – to deliver what passengers want, within a sustainable budget. We will also move to a more transparent, modern and flexible approach to fares and ticketing. We are launching a consultation today to take views on how these key aims can be achieved. It’s time to bring fares out of the 1970s and into the 21st Century. We will expand smart ticketing to give more passengers the kinds of benefits that travellers in the capital already enjoy with Oyster cards. Working with industry we will roll out smartcards across England and Wales and across different operators, increasing convenience for passengers. Smartcards are also pivotal to introducing a more flexible system tailored to customers, with a wider choice of tickets and season cards, recognising the reality that not all journeys take place five days a week during rush hour. Mr Speaker, If we duck the reform challenge then it won’t just be rail users and the public purse that pay the price… ultimately the rail industry and the wider economy will suffer too. So we want everyone working in rail, be it management or front-line, to help make these reforms work. By reducing costs and increasing demand set alongside this Government’s huge investment in railways there is genuine potential to boost jobs across the industry. It’s important to reform governance too. Network Rail is giving greater decision-making powers to its regional Route Directors, making it more responsive to local conditions and increasingly focused on day-to-day train operations at the local level. We welcome Network Rail’s efforts to find new and more efficient ways of managing its assets, including long-term concessions to third parties for the management of parts of the network. Network Rail is rightly taking steps to reform corporate governance… including its management incentives package… so that it is more accountable to passengers and freight customers. I would also like to welcome its sensible decision – to be announced shortly – to voluntarily appoint a Public Interest Director, who will ensure the concerns of taxpayers are fully reflected at board level and help strengthen the role of members. Mr Speaker, it’s time to give communities more control over local services. So today we are also consulting on devolving decisions about the railway to sub-national bodies. And our joint consultation with the Office of Rail Regulation on a greater role for the ORR in regulating passenger franchises closed recently. With a smarter regulatory approach, our aim is to remove Government from day-to-day industry involvement by adopting a more unified regulatory structure for the railways. We will publish our conclusions in due course. Mr Speaker, Facing up to reality… saving farepayers and taxpayers £3.5 billion a year… reforming our railways… putting the customer first. That’s what this Command Paper is all about. And, by working together on this package of reform, I believe industry, regulator and Government can generate the savings and the change we need. Lower costs, better services and ticketing offering greater choice and flexibility. A rail industry built to last because it’s efficient, effective and affordable. That’s what this Command paper will deliver and I commend it to the House. “There was much speculation about whether heritage trams would operate at all, but I am delighted to say that they will be here for everyone to enjoy from Easter this year,” says Trevor Roberts, Blackpool Transport’s Managing Director as he announces the Company’s adventurous plans for the forthcoming season on 7 March 2012. Heritage tours will commence on Good Friday and initially operate every weekend and Bank Holidays until the school summer holiday at which point they will operate daily. Illuminations tours will be bookable in advance and for the first time in many years, Illuminated trams will remain in service for the entire evening, adding extra sparkle to the Illuminations spectacle. The task of actively managing the future of Blackpool’s iconic fleet has fallen to Bryan Lindop, already well known for his significant heritage contribution on the tramway. Bryan said, “This will be the only place on the UK mainland where you can ride on a vintage tram on a public transport network. From now on, the heritage tram operation will be a whole new ballgame. Once the new system opens, vintage trams will no longer legally be able to operate in conventional stage carriage service and they will therefore become a pleasure ride. What we are doing in Blackpool in tramway terms has never been done before. The operation will be the direct equivalent of running heritage rail tours on a main line railway. Bob Mason, Blackpool Transport’s Director of Delivery commented, “The buzz word at the moment in Blackpool is regeneration and the regeneration of the heritage trams is a further positive step towards enhancing Blackpool’s visitor experience. Blackpool has seen significant investment in its seafront, its tramway and other iconic attractions such as the Comedy Carpet, Tower, Winter Gardens, Madame Tussaud’s and the Pleasure Beach. The Heritage Tram Tours are the latest contribution from Blackpool Transport towards the on-going regeneration of our world class resort”. Several Northern stations across Greater Manchester and Lancashire are set to benefit from Government funding to develop cycle schemes. Stations across the region, including Manchester Oxford Road, Manchester Victoria, Bolton, Blackburn and Blackpool North, will all receive new facilities to encourage passengers to travel to and from the station by bike. The Department for Transport confirmed its funding for a variety of schemes to be undertaken by Northern, including a £400,000 project to install sheltered cycle storage at seven stations across the region, featuring secure, swipe card access and the installation or upgrade of CCTV equipment. Manchester Victoria and Bolton stations will both be seen as ‘cycle hubs’ featuring the aforementioned storage facilities, as well the opportunity to hire bicycles on arrival at the stations, with a total investment figure of £700,000 for the two schemes. Ian Bevan, Managing Director of Northern, comments: “Today’s announcement is fantastic news for Northern and our passengers and the result of successfully working in partnership with the Department for Transport. This level of investment in our network’s cycling facilities will benefit our customers who want to choose the cost-effective, convenient and environmentally friendly option of using their bikes to get to and from our stations. Northern has also been awarded £800,000 to operate the PlusBike scheme from 25 of its stations, with confirmation of the stations to be announced in the near future. Greater Anglia customers are set to benefit from 3,500 new cycle parking spaces, following an announcement on 7 March 2012 by the Department for Transport (DfT). The train operator’s Cambridge station will gain 3,000 of these new cycle parking spaces, in proposals which will see the largest CyclePoint ever created in the UK with facilities for repair, hire and cycle sales all included in the project. The DfT funding will augment funding already pledged by CB1 developer Brookgate, as part of a wider station upgrade delivered in partnership with Network Rail. Greater Anglia’s Chelmsford station will be the location for a 500 space CyclePoint, which will include maintenance, information and cycle hire facilities. The train operator has already dedicated some of its own funding to this project, which will be augmented with contributions from the DfT and Essex County Council. A further, innovative scheme to improve cycle facilities for Greater Anglia customers will be the introduction of PlusBike cycle hire schemes at 15 stations across the Greater Anglia network. In this pioneering project, cycle hire or ‘plusbike’ will be an option for customers when purchasing their rail ticket, giving rail passengers the option to hire a bike for a day in addition to their rail travel. In total, Greater Anglia has successfully bid for funding worth £1.2m from the DfT’s Cycle Rail Working Group which will be invested in these three cycle schemes, in addition to the commitments it has already made to improve cycle facilities across its network, with additional cycle storage at stations and trial of a new cycle hire facility in Norwich. Network Rail has teamed up with Google to add some of its biggest stations to the online 360 degree Google Street View application, helping people to better find their way around some of the Britain’s busiest transport hubs. Over the past fortnight, the Google Trolley has captured images of the concourses of 13 stations including London Liverpool Street, Manchester Piccadilly and Leeds. Passengers and station users will soon be able to check the layout of the stations they are visiting, what facilities and shops there are before they set off. Owing to redevelopment projects ongoing at Birmingham New Street, King’s Cross and London Waterloo, these will be captured at a later date. First Great Western Managing Director, Mark Hopwood told delegates at TravelWatch South West's AGM on 3 March 2012 that rail passenger numbers in the west have risen by some 47 per cent since the beginning of his company's franchise - the equivalent of six million additional journeys every year. In 2005/6, customers made 12.5 million journeys on West services, compared to 18.5 million last year. Over the same period First Great Western has increased the size of its West Fleet by around 45 per cent with 145 vehicles in the fleet, compared to 100 originally specified in 2006. Mark said: "It is clear that more and more people are choosing to travel with us, and that's because of a number of different factors. The increase in demand for 'staycations' cannot be ignored - in a region where tourism plays a key role in the economy we recognise and cherish the role we play in bringing visitors in and helping them travel once they arrive. But we have also worked hard to deliver the services we know that our customers want. Our work with local authorities and user groups mean that our branchlines - written off long ago by many commentators - have never had a better frequency of service, and we've worked tirelessly with the Department for Transport and local partners to add additional capacity, and provide greater frequency and punctuality of our services." Record-breaking Class 91No. 91110 is to be named Battle of Britain Memorial Flight by TV star Carol Vorderman, in a spectacular ceremony to launch the nine-day Railfest festival at the National Railway Museum in York on 2 June 2012. The '91' will carry a specially-designed livery featuring the ‘planes and insignia of the Royal Air Force Battle of Britain Memorial Flight (RAF BBMF). Three of its iconic aircraft – the Spitfire, Hurricane and Lancaster – will fly overhead as Carol unveils the train in front of thousands of visitors at the opening of Railfest, a spectacular celebration of the railways. The locomotive, No. 91110, achieved a UK national speed record for electric traction - 162mph - on Stoke Bank, north of Peterborough, on 17 September 1989 – a record which stands to this day. The design for the locomotive will feature the three aircraft plus the Royal Air Force roundel, RAF BBMF insignia and ‘Lest We Forget’ motto. It will also feature a pair of ‘oak leaf’ cast iron plates commemorating its record-holding status, in similar style to those carried by the LNER steam locomotive Mallard, the world’s fastest steam locomotive. Mallard will stand nose to nose with the Class 91 at the naming ceremony. A programme of music and guests will entertain spectators before and after the locomotive is named. The ceremony will conclude with a further flypast by the RAF BBMF’s D-day liveried DC3 Dakota aircraft. The Railfest opening ceremony will begin at midday on Saturday 2 June 2012, featuring individual flypasts by the Spitfire, Hurricane and Lancaster aircraft in the run-up to the train naming. The three planes will then form up and fly together over the stage as Carol unveils the East Coast locomotive in its commemorative livery. Although various steam and diesel locomotives have carried aircraft names, this will be the first time a main line express locomotive will have been named and liveried in honour of the Battle of Britain Memorial Flight. It’s hoped that a number of RAF veterans will join serving pilots who fly the RAF BBMF’s collection of historic aircraft to witness the ceremony in York. Alongside them will be Squadron Leader Stuart Reid (Rtd) who flew the Lancaster bomber for the last 11 years of his career, and who first put forward proposals for the train naming. Tickets are now on sale for Railfest, the nine-day celebration of Britain’s railways, to be held at the National Railway Museum in York from 2 to 10 June 2012. For Railfest information and ticket bookings, and to sign up for an email newsletter, visit www.nrm.org.uk/railfest2012 Tickets can also be purchased by telephone on 0870 870 4840. Bombardier Transportation has launched its interactive YouCity innovation contest. The online competition is open to students and professionals with a vision for the future of urban mobility – from developed cities to emerging cities of the future. Candidates are asked to develop their concepts in one of three workstreams focused on: engineering (product definition, technical concept), business (business model, stakeholders, financing strategy) and urban planning (network layout, urbanism concepts, integration). They will be asked to apply their proposals to one of three types of cities: mature markets, BRIC countries (Brazil, Russia, India, China) or new emerging markets. The winning concepts will be evaluated by experts at Bombardier and voted for by YouCity’s online community at www.youcity.bombardier.com as well as on social media. Candidates are asked to register on the website by 13 May 2012, with each competing team allowed up to five members. To focus the contest, Bombardier has selected three cities to represent the different markets for urban mobility around the world: London, UK (mature market), Belo Horizonte, Brazil (BRIC market) and Vientiane, Laos (emerging market). Each team will choose which city and which stream they wish to compete in. The deadline for final submissions is mid-June 2012, after which the designers of the top concepts in each stream will be invited to Bombardier Transportation’s head office in Berlin, Germany, to collaborate on a final proposal. The winners will be invited to Berlin to develop a joint proposal for the future of urban mobility. They will present their proposal at InnoTrans, the world's largest trade fair focused on the rail transport industry, in Berlin in September 2012. In hosting this online competition, Bombardier is building on the success of its YouRail design competition, presented at the last InnoTrans in 2010. That competition attracted 4,239 entries and 8,565 comments on the future interior design of passenger trains. Many of these fed into ongoing research and development projects. Bombardier also contracted the services of one of the winners for the Industrial Design team at its site in Hennigsdorf, Germany. A new exhibition about the inspiration, history and creativity behind London transport maps opens on Friday 18 May 2012. Mind the Map: inspiring art, design and cartography will draw on the Museum’s outstanding map collection to explore the themes of journeys, identity and publicity. The exhibition will be the largest of its kind and will include previously unseen historic material and exciting new artworks by leading artists including Simon Patterson, Stephen Walter, Susan Stockwell, Jeremy Wood, Claire Brewster, and Agnes Poitevin-Navarre. The displays will explore geographical, diagrammatic and decorative transport maps, as well as the influence of the iconic London Tube map on cartography, art and the public imagination. The Underground, London Transport, and its successor Transport for London, have produced outstanding maps for over 100 years. These have not only shaped the city, they have inspired the world. Looking in particular at the relationship between identity and place, Mind the Map will explore the impact maps have had on our understanding of London and how they influence the way we navigate and engage with our surroundings. Mind the Map will be accompanied by an extensive public events programme and a book to be published by Lund Humphries - London Underground Maps: Art, Design and Cartography (£35.00). The exhibition will be displayed at London Transport Museum, Covent Garden Piazza, London, WC2E 7BB. Admission to the Mind the Map exhibition is included in the entry ticket to the main Museum galleries. Under 16s go free and adult tickets cost £13.50 (£10.00 for adult concessions) which allows free entry to all the Museum galleries for a whole year. The cross-country Felixstowe to Nuneaton rail route is set for further improvements as Network Rail begins work on building two 775m loops parallel to existing track east of Ely station. The work will enable better regulation of trains through the junctions at Ely and should be complete by summer 2013. The Ely loops form an important part of Network Rail’s strategic freight network, a programme of investment to improve freight capacity across Britain’s railway. They complement other work on the cross-country route, including the completion of gauge clearance of the entire route in 2011, the ongoing construction of a flyover north of Nuneaton station, and the Ipswich Chord which is currently seeking planning approval. Once all these upgrades are complete in early 2014, freight trains carrying the larger 9’6” or ‘high-cube’ containers increasingly used by global shipping companies will be able to travel more directly from the Port of Felixstowe to the economic markets in West Midlands, north-west England and Scotland without having to travel through north London, which they currently do, making a valuable contribution to the economy and helping Britain compete better in the global marketplace. Network Rail and principal contractor, Balfour Beatty have backed a community plan to remember the men who lost their lives building the Forth Bridge as part of an event to celebrate the recent completion of a 10 year restoration project. The twin memorials, in prominent public locations in North and South Queensferry, will also pay tribute to the thousands of ‘Briggers’ who contributed to building, maintaining and restoring the structure in the 129 years since construction began. The concept for the memorials was devised by a dedicated team of local historians and enthusiasts. Over the last seven years, they have researched the subject matter, rallied local support and raised funds for the concept. Network Rail and Balfour Beatty became principal sponsors to acknowledge the support of the communities north and south of the bridge and to recognise the dedication of the men and women who have worked on the structure during the past 10 years. The monuments were designed by local artist Gordon Muir and will be cast by Powderhall Bronze Ltd, Fine Art Founders, in Leith. The stone for the base has been sourced from Cumbria. The project will be managed by South Queensferry firm The Paul Hogarth Company and the Forth Bridge Memorial Committee team. Installation will be carried out with the assistance of Network Rail and Balfour Beatty. The two memorials will be unveiled at an event attended by First Minister Alex Salmond on Friday 18 May 2012. Marshall Scott, Managing Director of Balfour Beatty Regional Civil Engineering, commented: "It has been a privilege for Balfour Beatty to have undertaken the restoration of the Forth Bridge during the last ten years. The extensive works required to return the bridge back to its original condition will remain as a testament to the skills of the workforce that undertook the restoration works and to those that constructed the bridge over a century ago". First Capital Connect has launched ‘Your Ideas’, a new website designed to get customers’ views on how their journeys can be improved. Customers can visit FCC’s Your Ideas website and suggest ways in which FCC can improve their services, comment on other people's ideas and vote for those they think deserve to be introduced. Through sharing and discussing ideas, FCC wants to find the best ways to improve their trains, stations, communication and relationships with local communities. The ideas will be discussed weekly by the senior management team at FCC – the team in charge of operations, planning, communications and technology. They’ll work out which ideas can be investigated, which can be implemented right away, and which ones may unfortunately not be possible. Examples of ideas already suggested by customers include introducing electronic rail tickets for smartphones and alternative route information during disruption. Crossrail’s Liverpool Street station will serve the City of London and provide interchanges with London Underground’s (LU) Northern, Central, Metropolitan, Circle and Hammersmith & City Lines, connections to Stansted airport and National Rail services at Liverpool Street and Moorgate stations. The site of the Broadgate ticket hall sits directly above a 16th Century burial ground belonging to the Bethlehem Royal Hospital. Investigations by Crossrail archaeologists have confirmed the presence of up to 4,000 complete human skeletons two to four metres below street level. Excavation of the human remains will be completed before construction of the new Broadgate Ticket Hall commences. This will enable archaeologists to record and preserve London heritage and history. Crossrail will carefully rebury the remains after consulting with the Ministry of Justice. Hundreds of thousands of half-price tickets are on sale on ScotRail’s website from today until the end of March, the train operator has revealed. The ‘March Madness’ deal offers 50% savings on all online sales of Off-Peak Return, Super Off-Peak Return and Off-Peak Day Return tickets for trips started before 31 March 2012. More than 1.8million journeys were made using these ticket types on ScotRail trains last March. The train operator is hoping its new half-price deal will attract even more customers this year. At the Sassnitz ferry port on the German Island of Ruegen, Siemens embarked the first of 38 Desiro RUS regional multiple-unit trains bound for Russia on 1 March 2012. The "Petersburg" rail ferry is now shipping the five-car train via the Baltic Sea to the port of Ust-Luga in Russia. From Ust-Luga, the train will continue its journey by rail to a Russian Railways (RZD) depot in the Saint Petersburg area. The entire transport route from the Siemens factory in Krefeld to Saint Petersburg a distance of around 2,700 kilometers took about four weeks. Arrival is now scheduled for 7 March. Commissioning will then commence, and the first test and commissioning trips will take place in April. The passenger service of the first Desiro RUS trains will start in Kazan and Sochi in 2013. During the Olympic Winter Games in Sochi in February 2014 the trains will transport the athletes and spectators to the various sporting venues in the mountain area quickly and safely. Production of the Desiro RUS at the Siemens factory in Krefeld, Germany, started in April 2011. 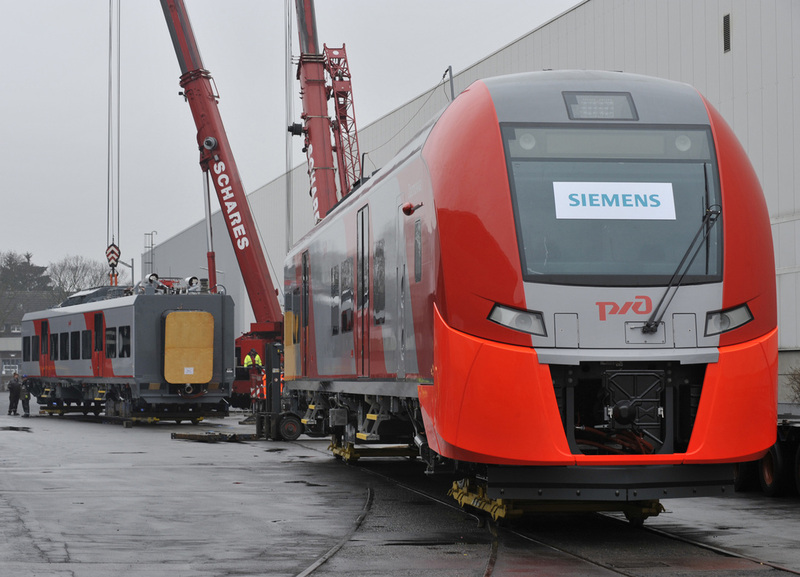 Nine months later, at the end of January 2012, Siemens and RZD signed the release for shipment of the first train. The first set, with a weight of 270 tons commenced its journey in mid-February: first as single vehicles from the Siemens factory to the Krefeld Rhine port over three consecutive nights. At the port, cranes lifted the rail cars onto an inland water vessel. The journey continued via the River Rhine and the Amsterdam-Rhine canal to Amsterdam, where the cargo was transshipped onto a coaster. Via the North and Baltic Seas, this ship took the train to the Sassnitz ferry port on the Island of Ruegen. Sassnitz is Germany's largest ferry port and the only one in Europe with Russian 1,520 millimeter broad gauge tracks. At the port the rail cars were, for the very first time, placed onto the tracks they were built for and coupled together to form a full trainset. On 1 March 2012, a locomotive pushed the train into the cargo compartment of the "Petersburg" railway ferry equipped with the Russian broad gauge. In about a weeks time Russian operator RZD will be able to welcome its first Desiro RUS, which they call "Lastotschka" (the Russian word for "swallow"), to a depot in the Saint Petersburg area. Siemens also performs the maintenance of the eight high speed trains ("peregrine falcons") at this depot, which were likewise delivered to the railway company by ferry via Sassnitz in the period from 2008 to 2009. From its base at the depot the new Desiro RUS regional train will commence its test and commissioning trips in April and travel to the test center in Shcherbinka in Moscow, the same complex which once tested the UK loco No. HS4000.